We'll follow up on our last review of Flagship's new Streamline range of products. Their intention is to offer salon-quality products with the convenience and affordability commonly found in our pomade products. There are unique characteristics in salon-focused products. They're typically convenient and in possession of a high strength-to-weight ratio. That's what we saw in the Matte Paste last week. Today, we're looking at their Traditional Pomade which is an oil-based pomade that's also water-soluble. Not completely new but a rare sight to see. The new design is similar to the Matte Paste. They have their updated logo which looks very good comparatively. The jar is our traditional four ounces. That'll please the lot of you I imagine. The aroma is officially labeled as black pepper and bergamot. You'll unquestionably pick up the black pepper. It's not too spicy (or else you'll sneezing left and right). It's like a herbal bite that's clouded in a smooth herbal sweetness. As you'd imagine out of an oil-based pomade, the wax makes it a bit thick to break down at first. Just give it a solid push and the product will begin to give way underneath your thumb. It breaks down super easily in your hands. A little bit of heat and friction will go a long way. This helps to apply it into your hair. I noticed it tends to grip the first hairs it comes into contact with, so keep this in mind as you try to apply it at the center where you need product. A solid shine while still being reasonable. This is the slickest product I've used in a while. Is that saying much though? I've been using a lot of clays and matte pastes. So, it's very slick but not all sticky and greasy -- definitely enough to keep all your strays together. It felt like a medium-firm in the morning, but quickly moves to a straight medium as you style it and through the day. This is tied down with a medium-light weight -- significantly lighter in feel than your standard oil-based. You'll be able to style quickly. I have no question that most of you here are very familiar with oil-based pomades. This one styles identically to your traditional oil-based pomade which is a big advantage for many of us. The nice this is that we can embrace the conveniences of it being water-soluble. Though the strength and weight suggested it, the resilience of this pomade is rather poor. Take into account that the point of using an oil-based is that the pomade remains completely soft and pliable during the day. That will always come at the disadvantage of endurance. If you're only sitting around during the day, then it can last a few hours. However, if you're moving around at all, carry a comb because that pomp is going to sway. Unquestionably possible but at the sacrifice of volume. It'll be difficult to get volume again, but I have no doubt that you'll hold onto the slickness. You'll feel a thin film of oil in your hair and possibly on your scalp in hot weather, but it's nothing like petrolatum-based products. Literally just add water. Very impressive. If you're someone who has stayed loyal to oil-based pomades and can appreciate the beauty of a very balanced medium-hold pomade, then this is likely a perfect match for you. 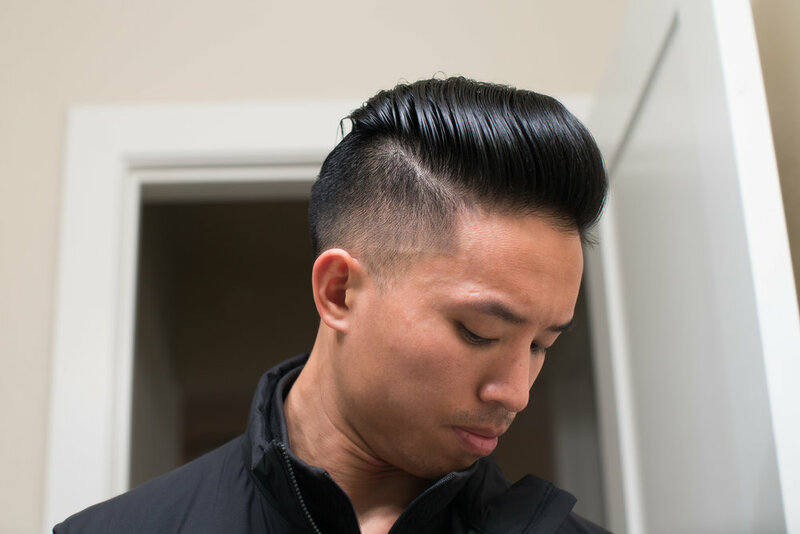 You can have your traditional styling characteristics -- not imitated as with a water-based pomade -- and even have the convenience of a water-soluble product. Let's reemphasize that IS an oil-based pomade. In that regard, I think it's super cool. My only thought is can we push the wax even further? Get more sturdy hold, clean up the feel a bit, and still hold onto it's solubility. If you're interested, we offer our promo code THEPOMP to help you save some money on your order with Flagship. Enjoy.